Enjoy a luxurious hand exfoliation with aromatic Dead Sea salts that leave the skin soft and luminous. This essential manicure includes nail shaping, cuticle care, and a durable gel base coat. Your experience is complete with an application of your favorite nail lacquer. Lasts approximately 10 days. 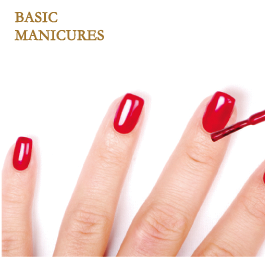 Our modified Basic Manicure for those on-the-go. Includes nail shaping, cuticle care, then finished with your favorite polish.